I normally cook a lot of vegetable dishes for our daily meals, but since we were having friends over, I thought it would be nice to make some meat and vegetable dishes and put together a traditional Chinese meal (along with some salad/liangcai dishes). I chose this dish for our guests because they just got married, and this dish is a typical one for happy occasions, such as wedding banquets or festivals. ‘Four – joy meatballs’ is the direct translation. In many English menus, it is translated as ‘Four Meat Balls Braised with Brown Sauce’ — don’t be confused with the ‘brown sauce’, it has nothing to do Western brown sauce, here ‘brown’ only refers to the colour. The original Chinese name for this dish is ‘Si Xi Wan Zi’, if you are in China, you probably have to mention this pronunciation, in order not to confuse the waiters. showing how Chinese like to play with words and similar pronunciations. It is said that in Tang dynasty times a poor ‘academic’ Zhang Jiuling obtained the best results in a government exam. The emperor admired his intelligence and knowledge, and asked him to marry one of his daughters and become his son-in-law. At the same time, Zhang’s home town was flooded, local people all fled, including his parents, with whom he lost the contact ever since. On the wedding day, Zhang was informed that his parents were found safe, and going to be coming to the wedding. Zhang was very happy hearing the news, then asked the chef to cook a meaningful and blissful dish for the happy occasion. So the chef came up with this dish. Meatballs — the round shape, in Chinese symbolizes ‘gathering’ and ‘union’, the chef named it as ‘Four rounds’, and explained, ‘one stands for each joy, first joy is for you coming first in the exam, second joy is for your wedding, third joy is for you becoming the son-in-law of the emperor, forth joy is for you being reunited with your parents — a family eventually all gathered together.’ Zhang was very impressed wand said, ‘why not just name it as ‘four joys’ then? 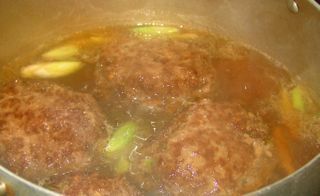 — four joy meatballs!’ (si xi wan zi), since then, this dish became part of traditional Chinese cuisine. Sometimes, you might come across another name for it — ‘red braised lion’s head’. — :))) Don’t be scared, it is because of the size of the meatball in the plate — which is actually another way of naming Chinese dishes – according to their appearance. This recipe certainly became one of the most popular dishes all across China, and its fame is mainly attributed to its ‘blessed’ name. The traditional recipe has remained unaltered. It is probably one of the very few dishes that have almost none regional variations. It is a not so complicated to make at home, and it is very presentable dish. Or if you are lazy to cook at home, it can be easily found in many restaurants. Ginger, spring onion, oil, coriander, sesame oil, corn flour, egg, light soy sauce, cooking wine, salt, anise star. 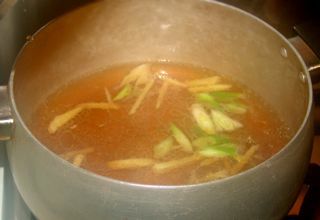 1) Chop the good piece of ginger and 2/3 spring onion into ‘mince’ pieces. 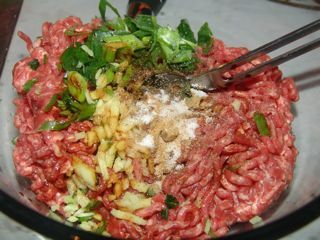 2) Mix the meat mince with ‘minced’ ginger and spring, 1 egg, 2 tablespoons light soy sauce, 1 tablespoon of cooking wine, 1 tablespoon of sesame oil, 1 full teaspoon of salt, 1 tablespoon of corn flour mixed with water, and 2 tablespoons of dry corn flour (you can also add 1 tablespoon of plain flour if the mince still not holds up together well. 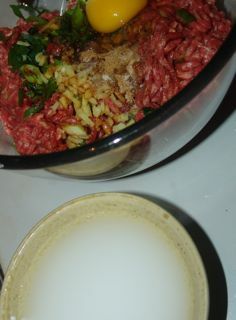 Also ‘wet’ corn flour is good for the softness and smoothness, and so that the mince balls will not get too dry.). 3) Shape 4 palm size mince into 4 ‘balls’. I placed them into the plate that I was going to serve them for measuring the size – it’s just easier for later. 4) Separately chop a piece of ginger and 1/2 of spring onion (preferably the green leaves part) into thin strips. 5) Wash and chop a handful coriander leaves. 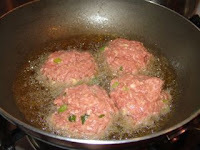 1) Fry prepared 4 big mince balls in the oil. 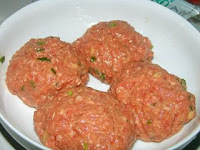 Make sure the surface of the minceballs are well fried, firm and crispy, but not burnt. Remove the minceballs from the oil after only 80% done — not completely done. 2) In a heated sauce pan (preferable with lid), pour in around 3 tablespoons of oil, when the oil is very hot, add in chopped ginger and spring onion, 4 – 6 anise stars to ‘stir fry’, then add 1 tablespoon of cooking wine, 2 tablespoons of light soy sauce. 3) Then add in around 3 cups of water, 1 teaspoon of salt, bring water to boiling. 4) When the sauce is boiling, place fried minceballs in, turn down the fire to low, cover the lid with a little gap at one side of the edge. Keep on cooking for further 40 minutes on low fire. 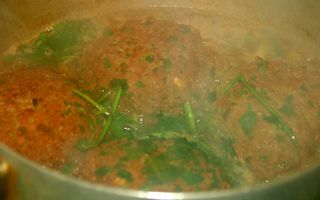 5) Around 10 minutes before it is done, add in the coriander. 6) When it is done, remove the minceballs from the sauce pan to the plate (deep edged plate). 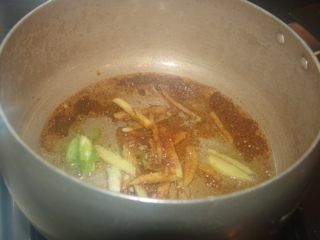 7) Pour the remaining sauce to a heated wok, add the corn flour mix in to thick the sauce. I like to have it with plain boiled rice, but beer or red wine are also good company.